Neighbours quickly passed around this information, and wrote letters about how easy it is to use Land Titles information to confirm that property owners are local. “We’re here, not overseas,” became the rallying call. Property owners wrote to the city about their property rights being violated by hunters. Neighbours emailed Council members asking them to come and talk to local owners before making any decisions. 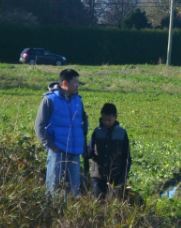 Councillor Derek Dang who grew up on farmland agreed with local residents and became an advocate. Sounds of gunfire ceased, until last Sunday, when a recreational hunter was back. Now we’re on the lookout and will be phoning City Bylaws and the RCMP to enforce the bylaw and charge the hunters under the section 39 of the Wildlife Act. Last week while cycling, at the end of the Finn where it dead ends at No. 3 Road, I saw a male with a rifle. Beside him was a child. 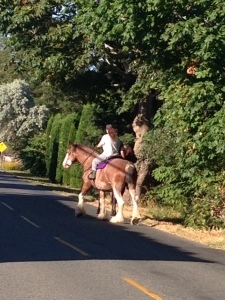 I stopped to take a photo and they saw me, and the adult tried to hide the rifle at his side. I asked what they were doing and they told me they were hunting ducks. 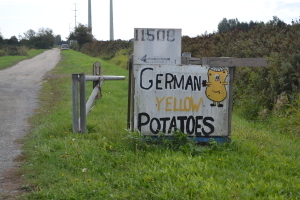 “It’s legal on farmland,” they said. I told them it is legal only if the hunter has the written permission of the property owner (see section 9), $1 million in liability insurance and stays 180 metres from roads and dykes according to the Regulating the Discharge of Firearms Bylaw. They disagreed and said what they were doing was legal. I told them they were violating section 39 of the Wildlife Act. They disagreed. I didn’t want to argue with someone with a weapon so I gave up. Cars were driving down No. 3 Road a stone’s throw away and there were joggers and cyclists. I decided to let someone else complain. Two years along with our neighbours, we spent a lot of time complaining about illegal hunters to the RCMP and the City of Richmond Bylaws department. All along Finn Road and No. 4 Road we were all repeatedly bothered by hunters who did not have permission to hunt. 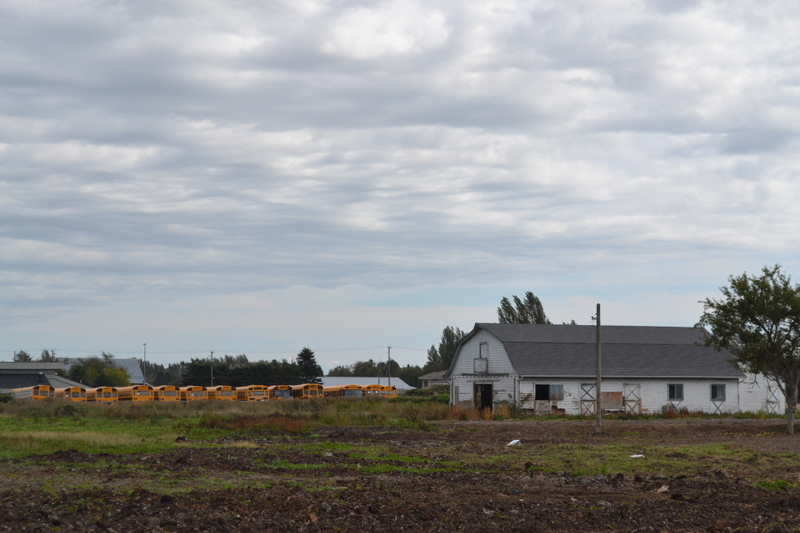 Almost daily, hunters were seen on the 160-acre Diamond Foundation property leased to tenant farmers and a large acreage then owned by Adera Developments also leased to tenant farmers. Sometimes as many as four vehicles with three or four hunters apiece would park alongside Finn Road and Garden City Road (to the right hand side) and sneak onto large farms. Property managers confirmed that the owners did not allow hunting due to liability issues. Neighbours also reported hunters seen along a rail line owned by CN Rail. CN police advised that hunters are not permitted on the rail line or the 50 foot right of way and to phone if we saw hunters. 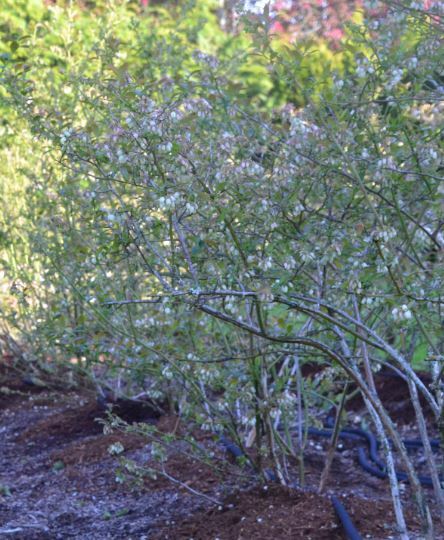 Illegal hunters hiding in bushes hunting ducks flying overhead is dangerous. Some tenant farmers have winter crops and are in the fields. 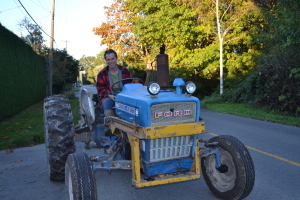 There are also farmers travelling slowly on farm vehicles, cyclists, joggers, wheelchair athletes, hobby photographers and recreationalists out for a stroll. 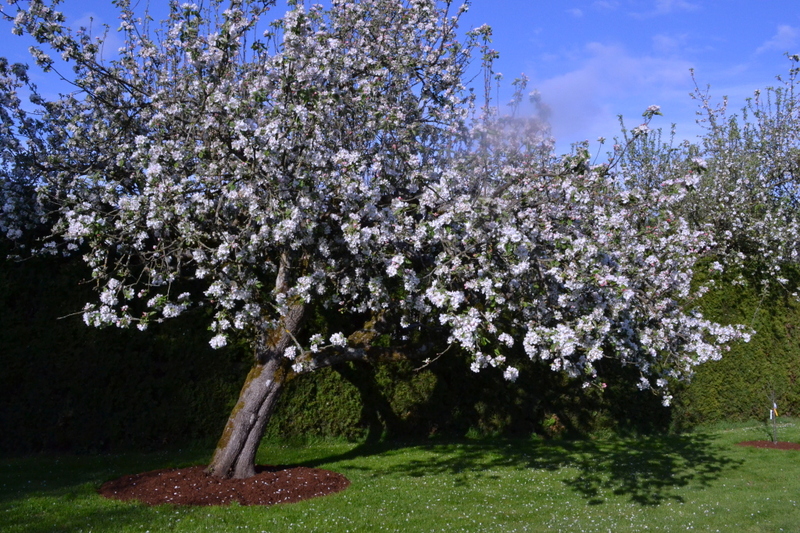 The sound of gun fire all day long also disturbs bees, so important for crop pollination. 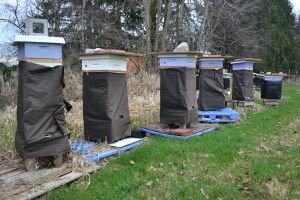 Bees can be temperamental and colony collapse is increasing. Gun fire is all it takes for a hive to stop thriving. Gun fire also disturbs bats – so important for insect control – and farm animals such as chickens, cows and horses. It’s hard to make a living farming, so farmers rent barn stalls to local subdivision residents who keep horses and ride them on the roads. 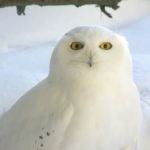 Owls, hawks and eagles disappear during hunting season and many don’t return. Next week – The City Listens. Here’s a recently published article I wrote. 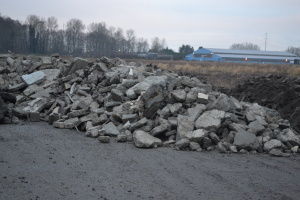 Two weeks ago, large trucks drove along the narrow, winding country road in our neighbourhood, turned into a south slough farm field and illegally dumped loads of construction waste on prime farmland at the end of No. 4 Road. 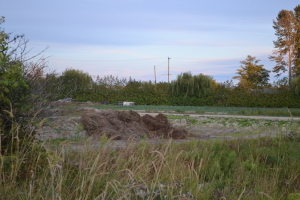 Local farmers complained to the provincial Agricultural Land Commission (ALC) which regulates farmland, the City of Richmond Bylaws Department and the RCMP. All three agencies visited the farm and the ALC confirmed the worst: the 24-acre farm, which had recently sold, was being used as an illegal dump site. 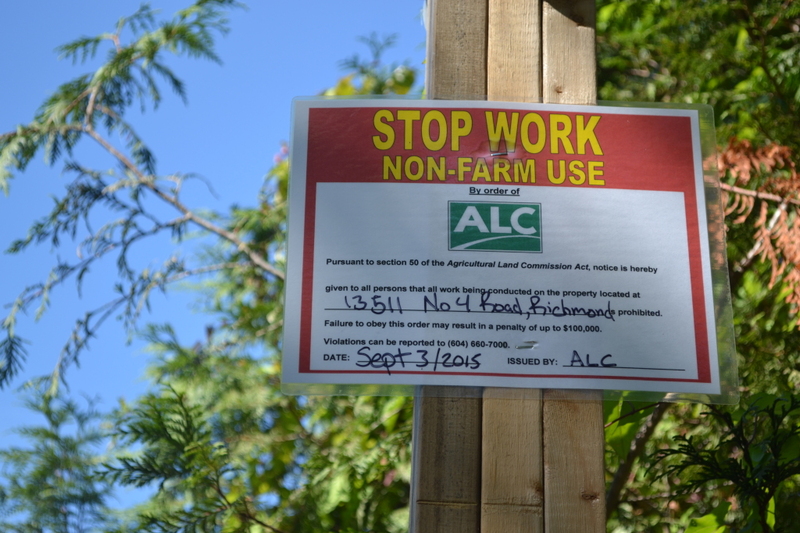 The ALC placed a “stop work” order on the farm because the fill was contravening the City Soil Removal and Deposit Activities on Agricultural Land Bylaw. Contractors charge as much as $650 a truckload to haul construction waste. A large part of this goes to dump fees at landfills – and there are fewer landfills that will take construction waste. 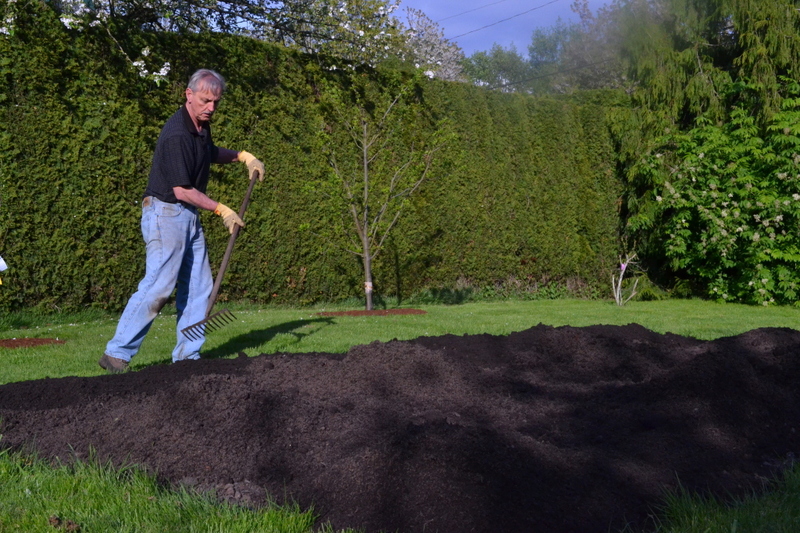 Local farmers estimate that tenants or new owners would have likely gotten about $200 a truckload, which adds up to tens of thousands of dollars for filling a field with construction waste and then covering it over with dirt. 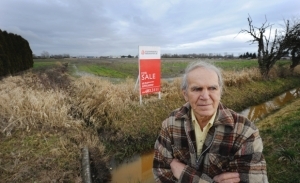 This isn’t the first time this has happened in our neighbourhood and it’s just one of many examples of increasing urban encroachment on farmland. In the last 30 years Metro Vancouver’s population has increased 70 per cent to 2,470,289 from 1,445,939 in a land-constrained area with the Pacific Ocean to the west, the North Short Mountains and the U.S. border to the south. 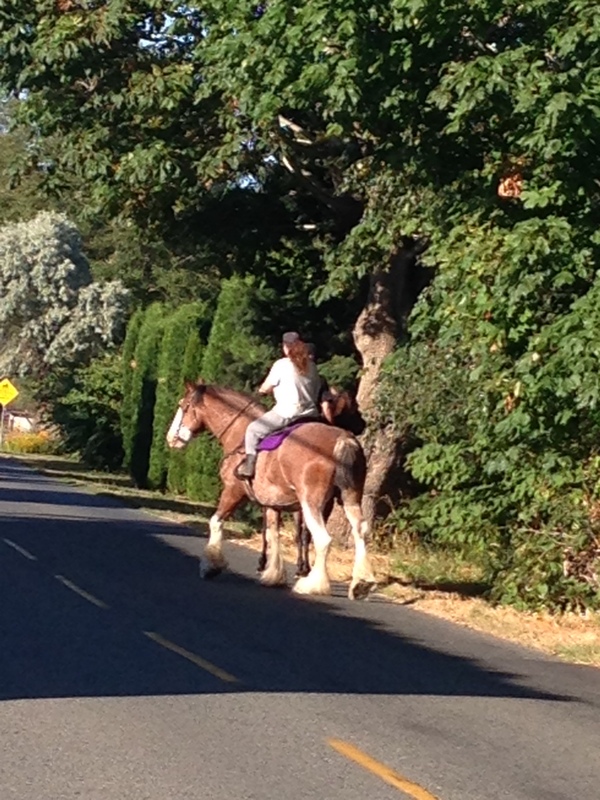 Residents and newcomers have headed east to more rural areas or to Richmond, just 20 minutes south on Lulu Island. Here, we’ve seen fertile farm fields alongside Fraser River estuaries paved over for large-lot detached residential sub-divisions, massive strip malls, car dealerships, industrial parks, gravel pits, commercial nurseries, soil fill operations, parking lots, golf courses, churches and temples, and highways. Farmland has also been developed at a blistering pace into agri-businesses such as horse boarding and training facilities, pet breeding, kennels, wineries and bed and breakfasts. In theory, this farmland has been protected since 1973 when the Agricultural Land Reserve (ALR) was established under the Agricultural Land Commission Act. 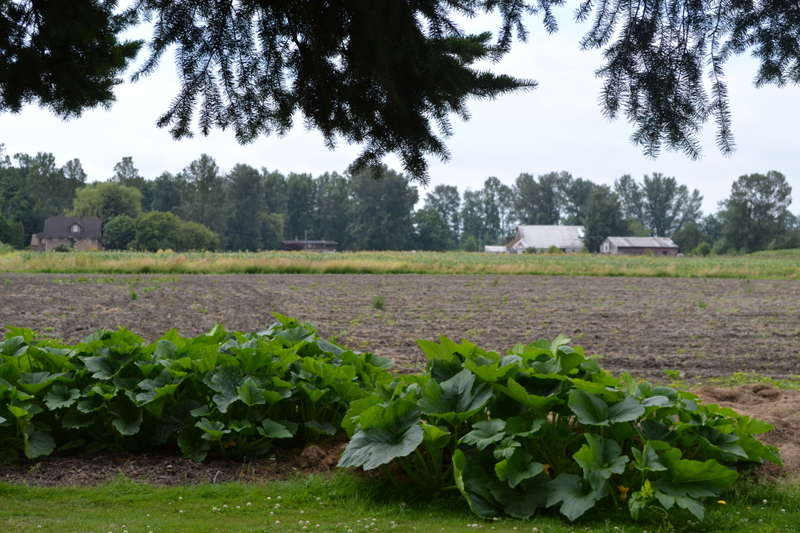 Province-wide, farmland was classified into seven categories using the Land Capability Classification for Agriculture in British Columbia and soil in the South Slough neighbourhood is class 1 and 2, the most productive with the best climate. 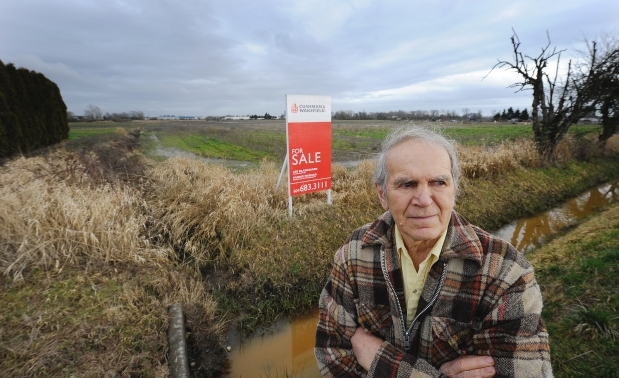 Although Richmond updated its Official Community Plan in 2012, and the mayor and council place a high value on protecting the City’s farmlands which supply locally grown food, other levels of government aren’t getting the message. 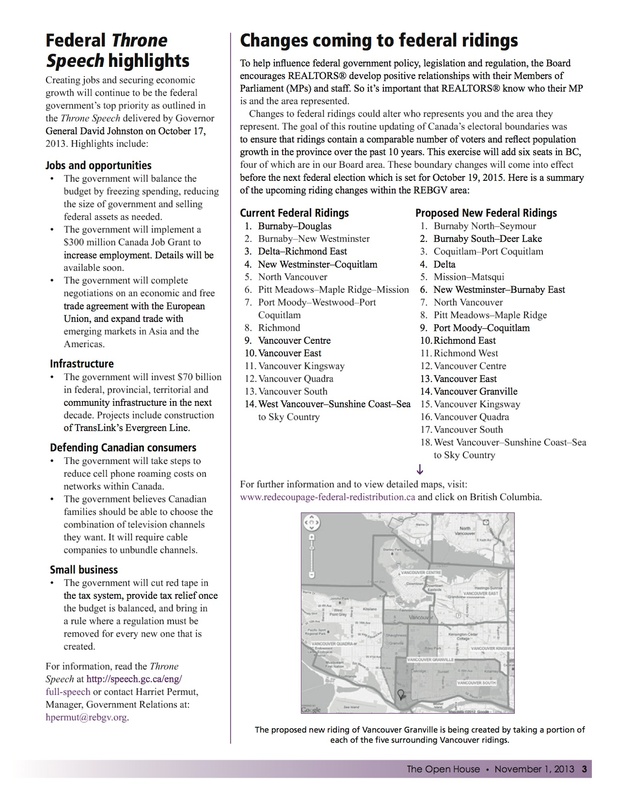 The federal Port Metro Vancouver has bought up fields for future industrial use, and the federal government plans to build a fuel line alongside farm fields, while the province is building a new 10-lane bridge on fields which grow berries, grapes and corn. Investors and speculators continue see the ALR as a land bank for residential and industrial development and exert pressure on politicians and their staff. If they manage to get land out of the ALR, they make a windfall. If they don’t, they build mansions on large parcels and then don’t farm the rest, paying taxes as though it was resident land. 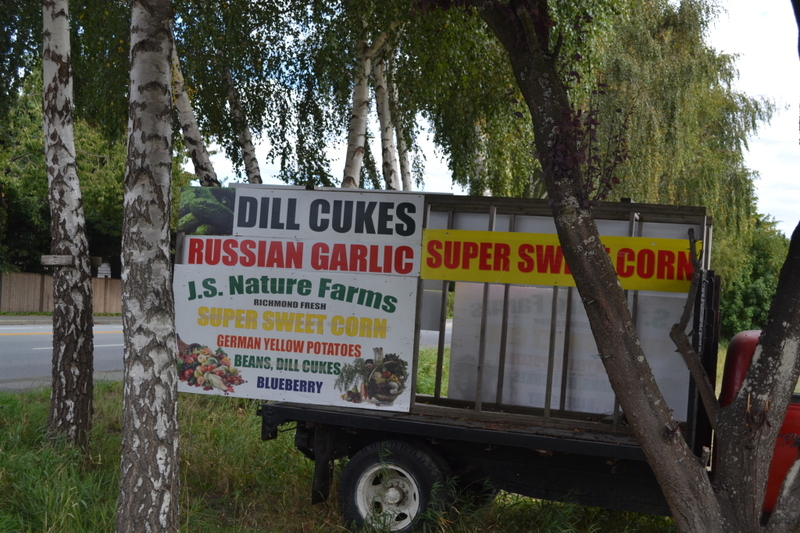 If they buy smaller parcels, they claim it can’t be successfully farmed, even when there is ample proof from farmers such as Curtis Stone who teaches how to make $100,000 a year farming as little as half an acre. Organizations which have land removed from the ALR for institutional uses such as churches and temples are supposed to farm part of it, but often don’t. There’s a sense of urgency for anyone shopping in local grocery stores and seeing the price of food spiking due to the drought in California and the low Canadian dollar. 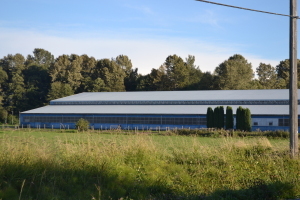 Here we produce only 45 per cent of our food, although we have the highest capacity farmland and it contributes billions of dollars in revenue to Richmond’s economy, with each farm earning an average of $228,000 each year. There is reason for some optimism. 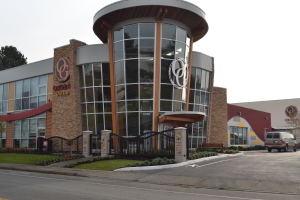 In partnership with Kwantlen Polytechnic University, Richmond now has a farm school, and graduates are knocking on doors looking for land to farm. 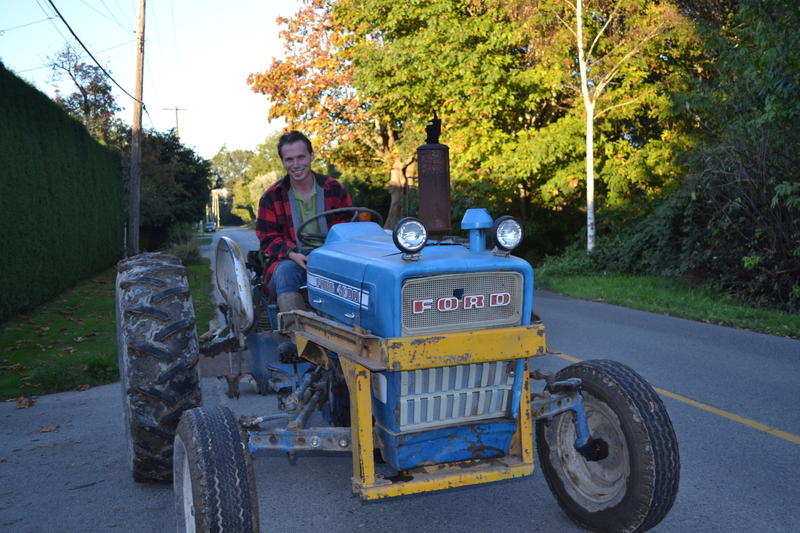 Instructors are also farming – showing it’s possible to succeed on smaller parcels of land. 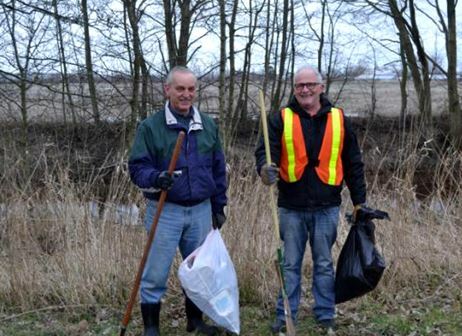 In the meantime, residents of farm neighbourhoods and organizations such as the Garden City Conservation Society have their eyes open and their phones handy to report non-farm uses. Urbanization pressures will only intensify due to ongoing population growth. 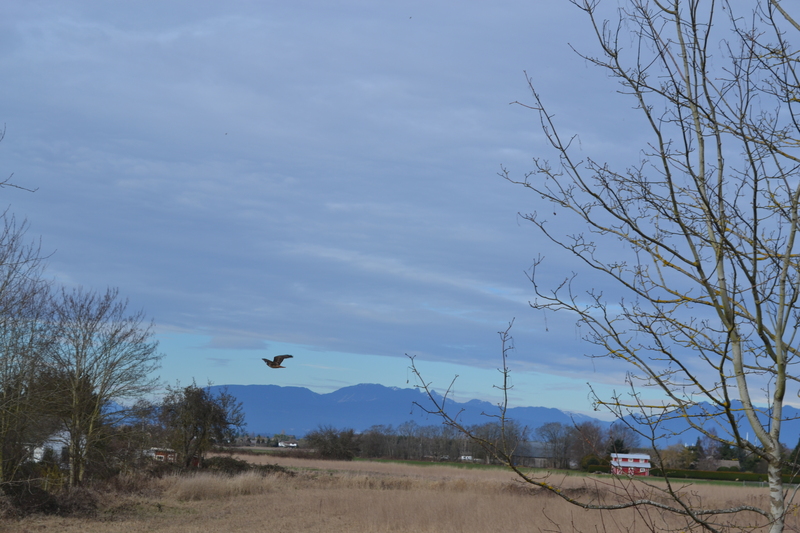 In the South Slough area, a decade ago, we would often see bald eagles, hawks, and Barn, Barred and Snowy owls. We would sit silently, still alongside the Woodward Slough, an estuary habitat beside where the Fraser River joins the Salish Sea, which flows into the Pacific Ocean. Here we would watch Great Blue herons, muskrats and river otters. Once we saw a Sandhill Crane, another time, a beaver swimming along. At night, we would hear the cacophony of American Bull Frogs and Green Frogs in the Woodward and Finn Sloughs, and we’d catch glimpses of bats swooping up and down the fields and bogs. But residential developments a mile to the north and Industrial development half a mile to the east have made our wildlife sightings less frequent. Light pollution is part of the problem. Eagles used to nest alongside the Finn Slough until the City installed bright flashing lights where a speeding car crashed at a turn on the winding country road. The eagles didn’t return the following year. Bats, frogs, birds and insects also need darkness. Poorly designed artificial light spilling from streetlights and industrial buildings and parking lots can disrupt commuting patterns and flight routes so that wildlife becomes confused and may be unable to feed themselves and even to reproduce. Sightseers and visitors to the area also throw litter out of their vehicles, covering sloughs and agricultural land with fast food wrappers, plastic drink containers and aluminium cans. Sometimes they dump old televisions, computers, furniture and mattresses. 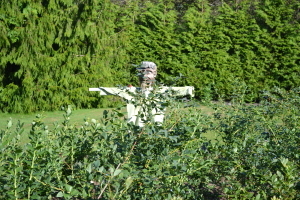 Hunters also come onto farmland during the autumn hunting season. Although they’re required to have the permission of property owners to hunt on agricultural land, hunters trespass to shoot wild fowl. The constant sound of gunfire fire disturbs bees, so important for our crop pollination, and bats, needed for insect control because the sloughs are mosquito breeding areas. 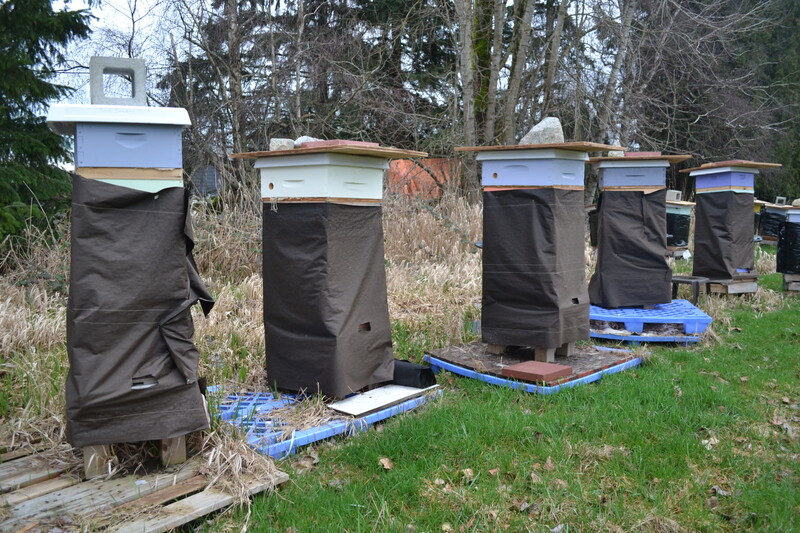 The neighbourhood carefully nurtures bees and bats, building hives and bat boxes. We leave out food for birds, and one neighbor managed to bring back some pheasants. Hunters disturb this fragile eco-system and shoot the birds. Walkers, cyclists, nature seekers and photographers however well-meaning also effect wildlife in ways we all never imagined. On a sunny day, the constant disruption by hundreds of visitors on foot and on bicycles affects even the toughest and most urbanized raccoons and coyotes who need quiet to care for their young. 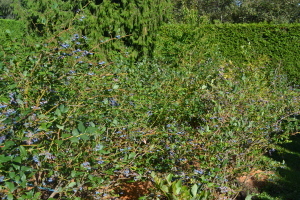 Visitors pick wild blueberries in the bogs, taking food away from wildlife. At the same time, they feed wildlife granola bars and sandwiches making raccoons, coyotes and skunks reliant on handouts. In response, the City of Richmond has spent a great deal of effort in developing an Environmentally Sensitive Area Management Strategy. It aims to protect ecosystems on public and private lands and the areas it covers include farmland and farmed edges, fields with a history of cultivation, and sloughs, marshes and bogs. 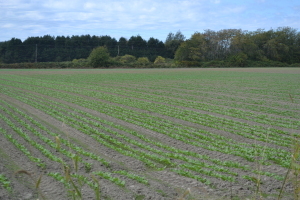 Almost 52% of Richmond’s environmentally sensitive lands are on farmland in the Agricultural Land Reserve. But again, there are jurisdictional issues. The Federal government protects fish habitat under the Fisheries Act and protects migratory birds and species at risk under the Species at Risk Act. The Provincial government protects farmland under the Agricultural Land Commission Act and Regulation and protects streams through the Riparian Areas Regulation. Sometimes it’s impossible to know who to phone when someone is throwing garbage into a slough. The result is a great decline in biodiversity, according to Michael Wolfe, a local biology teacher. 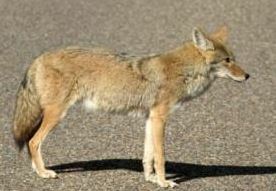 “The two main drivers of habitat degradation are urbanization and invasive species,” said Wolfe. The first time I was asked to write about affordable home ownership, I went looking for what had already been written. 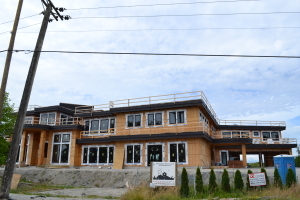 “The eco-density rabble rousers trying to whip up a public storm to challenge Vancouver’s commitment to EcoDensity should be stopped cold in their tracks. We can’t afford to yield our small effort in the global climate change challenge to their indignation and hyperbole. 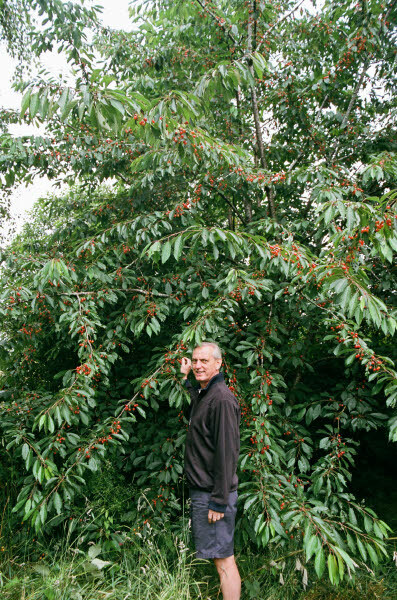 EcoDensity is a brilliantly conceived brand name for a simple shift in the way we look at how development is planned. At the time, when 4,000 sq. ft mini-mansions on distant subdivisions were seen as the ideal, Bob suggested we should think about living smaller and closer in. He’s still at it in his February 21, 2014 column. I think more of us are listening. Click the article to download a PDF.